Now – learn Mishnayos in Hebrew as never before. A multi level Hebrew elucidation of Mishnayos for the layman and Talmid Chacham alike. Now, learn Mishnayos at the level of your choice – quickly or in depth. Review the halachos of the Mishnah as they appear in Shulchan Aruch. All-in-one volume specially designed for ease and clarity. 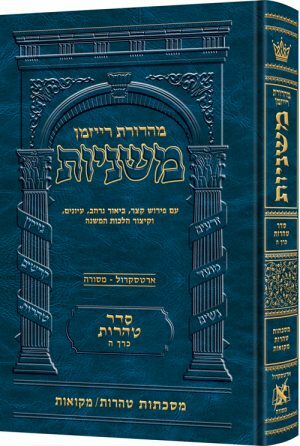 Biur Ha’aruch – a clear and expanded explanation of the Mishnah, based on the commentary of Rav, the Gemara, and the classic Rishonim and Acharonim. Iyunim – further discussion of questions and interesting issues arising from the Mishnah and commentary. HaMishnah B’Halacha – summary of the halachos that emerge from the Mishnah, as presented in Shulchan Aruch.